Business View Magazine interviews Drake Nakaishi, Executive Director of the Chester Economic Development Authority, as part of our series on American cities. Chester, Pennsylvania, a city of 33,000 in Delaware County, sits on the western bank of the Delaware River between Philadelphia and Wilmington, Delaware. The oldest city in the Commonwealth, Chester was originally settled in 1644 by Swedish immigrants, and called Upland. 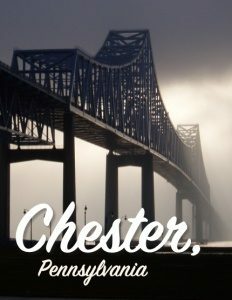 Its name was changed to Chester in 1682 by William Penn, and it became an incorporated city in 1866. For its first few hundred years, Chester was a prosperous and wealthy manufacturing community with industries concentrating on machinery, metal and locomotive manufacturing, shipbuilding, and textiles. Chester experienced its first major period of growth in the early 1900s as a result of the country’s entry into World War I, and another period of economic expansion took place after World War II; by 1950, its population peaked at 66,000. However, by the 1960s, the city began losing its mainstay shipyard and automobile manufacturing base, and the population began to plummet. In 1995, the state designated Chester as a “financially distressed municipality,” and in 1999, it became eligible for Pennsylvania’s Keystone Opportunity Zone (KOZ) program, a state initiative that offers tax incentives for investments in KOZ-designated areas. Since the late 1990s, Chester has received 1.36 billion dollars in public and private investment, funds that the city has used to restore its parks system, improve and expand its housing, attract new business, generate thousands of job opportunities, and invest into future development projects. Drake Nakaishi is the Executive Director of the Chester Economic Development Authority, a quasi-governmental agency whose Board members are appointed by the City Council and the Mayor. The Authority’s mandate is to administer, on behalf of the city, funds from the United States Department of Housing and Urban Development’s (HUD) Community Development Block Grant (CDGB) program for community services activities such as affordable housing and anti-poverty programs, as well as for infrastructure development and demolition. Nakaishi also heads the city’s Redevelopment Authority, another quasi-governmental agency, which is charged with selling Chester’s 600 pieces of city-owned property to potential developers. Nakaishi speaks about some of the current projects going on in the city: “We’ve broken ground on an 89-bed, all-suite hotel next to City Hall,” he begins. “It’s a Candlewood Suites, part of the Holiday Inn chain. One block from City Hall, we have a construction company that is revitalizing one of our old storefronts to put in a new retail location, called Villa. It’s high end sports shoes and apparel. They’ve started demolition and we’re hopeful they can open within a year. “We are also helping to support some improvement on the Kimberly-Clark site in the city – they have about 600 employees and they’re planning a new co-generation plant that will switch from coal to natural gas, so we’re helping them secure $28 million from the state – what they call a RACP grant and other state funding for the conversion. That will make them more competitive and also enable them to reduce their carbon footprint. “PennDOT (The Pennsylvania Department of Transportation) is re-doing every bridge and overpass on I-95 that is in the City of Chester. They’re also improving the on and off ramps for getting in and out of the city and they’ve already started construction of those ramps. It will take about another 18 months to complete. We’ve also gotten a PennDOT grant for improvement of Avenue of the States between 6th and 7th Streets. It will greatly help our merchants and we’re hopeful that some of the vacant storefronts will then change over because of the improvements that are seen. “We have at least five medical cannabis companies that are trying to secure a license from the Commonwealth of Pennsylvania for a growing and processing facility in the city. Two of these potential licensees have secured options to purchase land from us. Three others have gone out in the private market to secure land and/or buildings in hopes of getting their license. None of the companies were successful in getting a license in the first round; the second round is going to open up in November and it’s hoped that one of these companies will be able to secure a growing and processing plant. If we get one of those sites, there will probably be about 50 to 60 jobs created. We’re hopeful that will happen. “We have multiple developers that are looking to purchase the Alfred O. Deshong Museum and park – it’s about a 14-acre site that has an old museum. While the property is under the control of the Delaware County Commerce Center, we do have some adjoining properties that could be included in a development. We have one developer who is interested in developing a strip mall. We also have another group, led by the Cambodian Ambassador to the U.S., looking at putting in an educational and cultural center on that site, along with a temple. We have some other developers interested in that site, as well. So, we’re starting to see a lot of momentum in that particular location. In order to entice new business ventures, Nakaishi says that there are various incentives available. “Some properties are in Keystone Opportunity Zones – that’s where there’s tax abatement for seven years on state tax, municipal, county, and school property taxes,” he states. “And that really helps a business to start and it reduces your outlay for the first few years. Also, if it’s not a designated KOZ zone, we have LERTA – Local Economic Revitalization Tax Assistance, and that’s tax abatement; it includes county, city, school property taxes on any improvements, and it’s a graduated abatement for ten years. At the end of ten years, you’re paying the full assessment on your improvements. On top of that, we do offer, on occasion, low interest, small business loans. But it’s one of those things where it has to be a solid business, it has to have collateral, and we try to make sure that we’re doing proper underwriting. In many cases, these are federal funds that we have to manage in a prudent fashion. “The one thing that we have going for us is the low cost of land in Chester. On occasion, we have offered incentives to developers if we see a mutual benefit for the City and is a project we believe will provide strong economic growth potential and needed jobs. All such projects require a redevelopment agreement between the developer and the Redevelopment Authority. The Redevelopment Authority Board and City Council must approve all agreements. We are also willing to work with developers for good projects to help seek state assistance, such as low-interest loans, tax credits, and/or grants.